Ugo Rondinone, still.life. 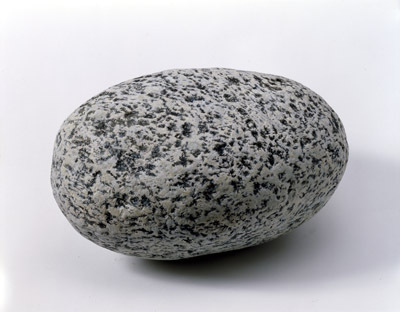 (black and white river stone), 2008, cast bronze, lead, and paint, 5 15/16 x 11 x 8 5/8". This two-artist exhibition should help corroborate SculptureCenter's renascence, after its longish quiescent period, as a major venue for contemporary exhibitions in New York. If all goes well, the results should be plastic-fantastic-inevitable. Martin Boyce is known for taking fluorescent tubes into metaphoric places that would give Dan Flavin the shudders, and this show promises, among other things, a suspended spiderweb-like sculpture made out of, you guessed it, standard-issue fluorescent tubes. Ugo Rondinone, no stranger to the pretty, the perverse, the grotesque, and the breathlessly romantic in his sculptures and installations, presents four new works, including a functional fireplace based on a Victorian original that is built into a freestanding wall. Boyce and Rondinone—fire and ice!